The defining event in the Hungarian world of coffee and bars, the CoffeeBar Bazaar (KávéBár Bazár) will be organised for the tenth time this year in Hall B of the Millenáris Park on 9-10 February. With their entrance ticket, visitors can taste the products of more than 40 exhibitors (coffees, teas, wines, beers, spirits and other drink specialities) all day long. Hungarian manufacturers and well-known commercial brands will all be present among the exhibitors, and besides tasting them, you can also buy the products too. The event will showcase top-quality products and feature the crème de la crème of the Hungarian market. Three national championships will also take place during the two-day event: baristas will challenge each other at the Hungarian Cup Tasters Championship, and the winner will represent Hungary at the world finals in Berlin. A few years ago, a Hungarian taster won the world coffee-tasting championship, and this year’s local contestants seem highly trained too. The national contest for “civilian” coffee specialists, the Hungarian Amateur Barista Championship, will be held on Saturday, and the competition will take place according to strict professional rules. Sunday’s big competition, the Hidegháború (Cold war) – Cold Brew Cocktail competition, will be organised by the Hungarian Bartender Association and followed by a bartender conference into the evening. However, besides the championships, the CoffeeBar weekend will also feature shows, presentations and guided tastings, and you can even expect robots to turn up. The shows will begin at 1:00 pm on Saturday, but there will also be a raw coffee course organised by Kilimanjaro Speciality Coffee, an Indonesian coffee tasting sponsored by the Indonesian Trade Promotion Center, a home barista workshop, a round-table discussion on coffee and a masters’ course in champagne to end the day. Besides the championships, Sunday afternoon will commence with a truly unique presentation: robots from Enjoy Budapest Café will visit the event, and the owners of the café will present what life is like with their robot colleagues. The Pink Project presentation promises excitement too, by introducing a new type of coffee, and you can learn the basics of professional “coffee sensing”, i.e. taking a peak into the work of coffee tasters. This will be followed by a 19-gram roaster straight from Berlin, which will be presented at a workshop, and in the late afternoon you can visit a special tea presentation accompanied by creative tea cocktails. The stands will also host exciting side programmes such as tasting coffee cocktails, brewing coffee with soft or hard water, cava and prosecco tastings and other limited tasting programmes, which are all included in your ticket. Besides coffee specialties, admirers of Italian espresso will not go home disappointed either, while there will be plenty of tea, and tea cocktails, at the event too. This year the organisers have put together an extended selection of gastro delicacies too: sushi, tapas, soups and dessert specialities will all be up for grabs at the stands. Entrance tickets include unlimited or limited tastings of coffees, teas, wines, champagnes, beers and spirits. The event is open to professionals and non-professionals alike between 11:00am and 7:00pm at the weekend, and the industrial hall will be filled with the aroma of coffee; a live DJ will ensure a great atmosphere, and over the two days you can learn, test, buy, have fun and socialise in the company of top-quality coffee and bar drinks. Two roasters are presented each day at the stand, one in the morning, one in the afternoon. Professionals can prepare coffee drinks from their own coffee (even ground on site) using a ROK Espresso machine at the stand with water of various softness. 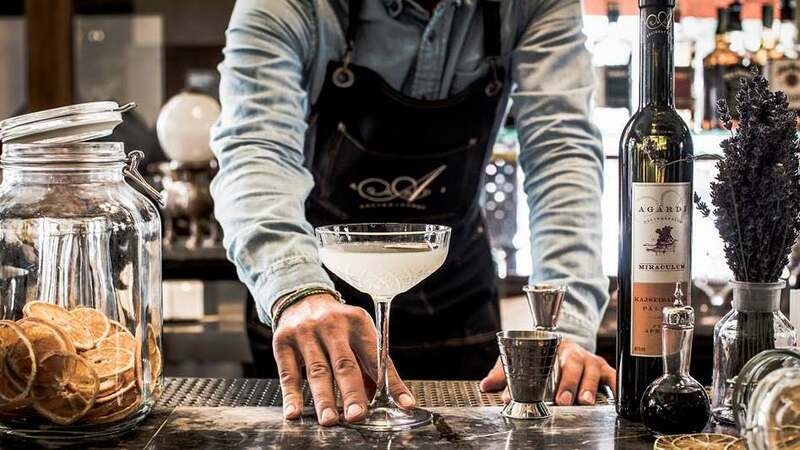 Coffee cocktails and cocktail specialities from the spirits of Agárdi Bár and with bartender Gábor Dreghiciu at 2.00-3:00pm and 5:00-6:00pm on both days.